DVDInMotion: Unlocking video playing while driving without hardware. On a long journey or in slow-moving traffic you and especially your passengers often regret that despite your car's modern multimedia system, they can't watch videos while the car is in motion. Responsible drivers are always watching the road and not the screen. It's not a difference whether it shows a navigation map or a video picture from the TV tuner or the DVD player. So why restrict other people in the car? They can enjoy the ride too. You just need to remove the limitation which causes the screen to go black every time the car moves. You don’t need to install any hardware module into your car anymore. You don’t need any diagnostic equipment. No cables, no tools. To unlock the TV or the DVD video while driving you can simply order our software and enable the video on your own. With this software it will be easy, fast and safe. Why do you need DVD in motion? If your car is equipped with TV and/or DVD function, you might be disappointed from the beginning. Instead of showing your favourite movie, the screen goes black. Video playback while driving is disabled for most cars. But what if your passengers want to watch a movie? They simply can't. Normally you could play a video only while the car is parked or at a very low speed. And that's where dvdinmotion.com comes in with a truly unique solution: With our software you have the ability to activate videos while driving. With no hardware at all! 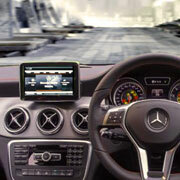 Our unlocking software is compatible with most of Mercedes-Benz cars. 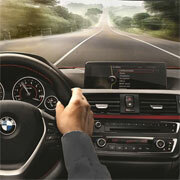 We will create the software for your car. Unlocking the video is then a matter of simply inserting the disc into your car. After the payment you will receive the download link within 24 hours. It usually takes much less time than 24 hours. and burn it onto a CD or DVD. Instructions how to burn the disc are included. Take the disc into your car and follow the instructions provided. It takes only 2-3 minutes. We accept PayPal and credit card payments. Available all over the world with focus on highest security. With DVDInMotion software you can restore the original state at any time, that way you don’t need to worry about the warranty of your car. And you can enable it again whenever you want, without any limitations on count or time. The software works like a toggle switch, you can enable/disable video in motion anytime by simply running the installation procedure again.